Did All Chacoans Live in Kivas? 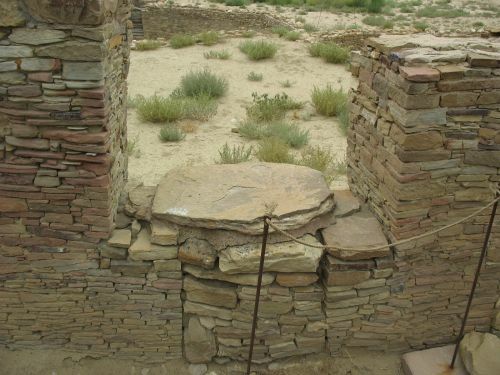 I’ve been talking quite a bit lately about the idea that kivas in Chacoan great houses were residential spaces, but it’s important to note that there are in fact other rooms at these sites that show at least as much evidence for residential use as the kivas do. 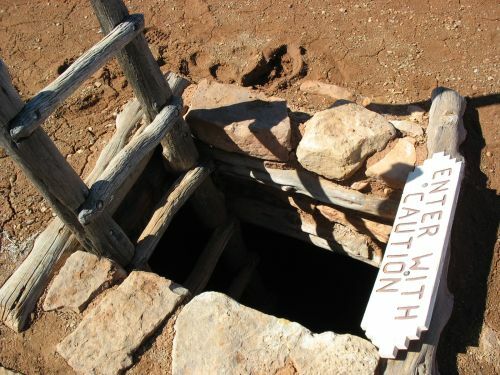 These are typically large square or rectangular rooms facing plazas, often with T-shaped doors opening into the plazas, and they have firepits, storage pits, mealing bins, and other features typically interpreted as indicating residential use. Arguments that Chacoan great houses were not used residentially at all tend to gloss over the presence of these rooms, and arguments that great houses may have had some residential functions but were primarily used for other purposes tend to focus on the small numbers of these rooms at excavated sites such as Pueblo Bonito and Chetro Ketl. And, indeed, not very many rooms have these features. Using the fantastic database that the Chaco Archive is putting together, I find only 134 “thermal features” at Pueblo Bonito out of about 400 excavated rooms. Note that this figure includes all formal hearths as well as more ephemeral heating pits, and that it includes kivas as well as rectangular rooms. I do think it’s reasonable to think that most kivas were residential, of course, so this isn’t as big an overestimate as it might seem at first glance, but it’s still an overestimate. 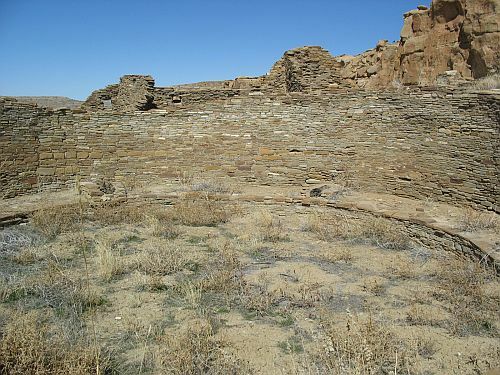 Storage features are even less prevalent, with only 107 documented at Pueblo Bonito. Furthermore, chronological control during early excavations was not great, so it’s not totally clear when in the site’s long occupation history these rooms were used for residential purposes; it’s quite possible that they started out as residential rooms and later were converted to some other use when the use of the whole site changed. Still, those plaza-facing square rooms do pose a challenge for Steve Lekson‘s arguments that kivas were residential, because they seem to take the place of the kivas he posits within residential room suites. 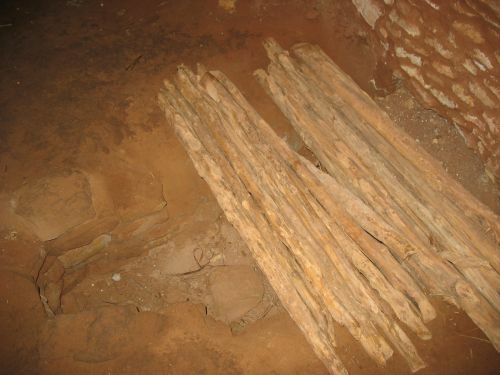 Indeed, some even have kiva-like features like ventilation shafts, particularly in the western part of “Old Bonito” where many of the rooms were later used as burial chambers. Tom Windes has pointed to this as a challenge to Lekson’s interpretation of kivas, and indeed it seems tricky to interpret. Why are there two different types of rooms that both seem to indicate similar residential uses? 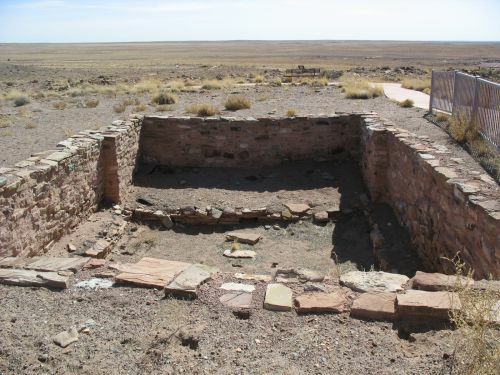 Were kivas and plaza-facing square rooms part of the same room suites? Were the kivas sunk into the plaza in front of the room suites used for some sort of multi-household purpose, as Windes has proposed, rather than being individual household residential spaces? If so, what? 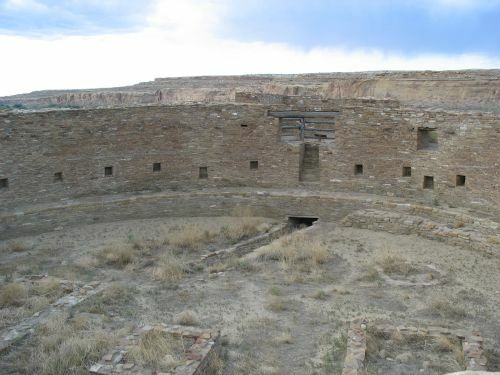 It is noteworthy that, to the extent that we can tell based on the existing architecture, there generally seem to have been too few kivas in early great houses for each room suite to have had its own. It’s also striking that while some room suites at early great houses are very obvious sets of interconnected rooms, others are much more difficult to interpret and may not have had quite the same functions. And it’s here that I think a possible answer to this puzzle may emerge. Looking at the distributions of kivas and square rooms with residential features, I think it’s possible that there were two separate traditions or styles of domestic architecture that we see in early great houses: one based on a “Prudden unit” with a kiva and a few surface rooms used for storage, and another based on a “room suite” with a large living room, containing a hearth, taking the place of the kiva and being directly connected to two or three smaller storage rooms behind it. Where these styles may have come from and what, if anything, they represented socially is still an open question as far as I’m concerned, but it’s something I’ll be looking into. 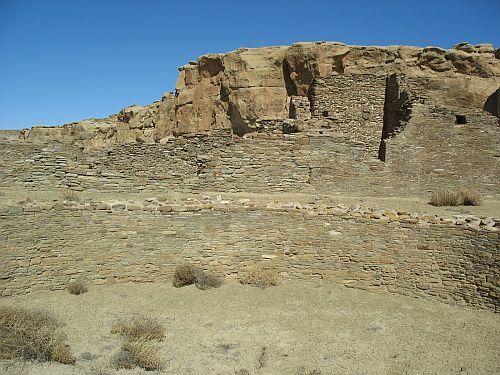 Tentatively, I’m thinking regional variation in architecture is perhaps the most likely answer, especially given other lines of evidence suggesting that Chaco was a multiethnic community incorporating people from a variety of geographic and cultural backgrounds. It’s also possible, however, that these differences reflect some other dimension of social diversity, or that they have no relation to any such type of diversity that we can see in the archaeological record today. 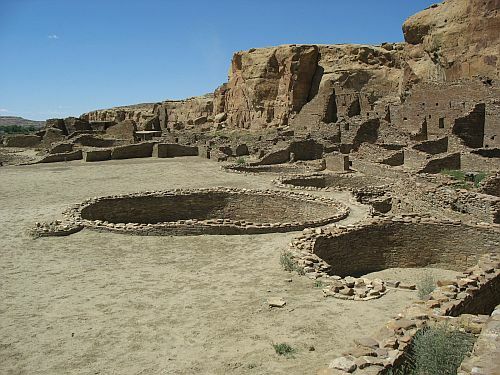 If the people who lived in kivas and the people who lived in square rooms were different people in some meaningful sense, that has potentially important implications for many aspects of the Chaco system. I’ll try to tease out these implications in upcoming posts, and I’ll also look at some other lines of evidence supporting this idea. If Kivas Were Residential, Who Lived in Them? My kiva posts so far have mostly focused on form rather than function, but function is really at the core of most arguments over kivas these days. 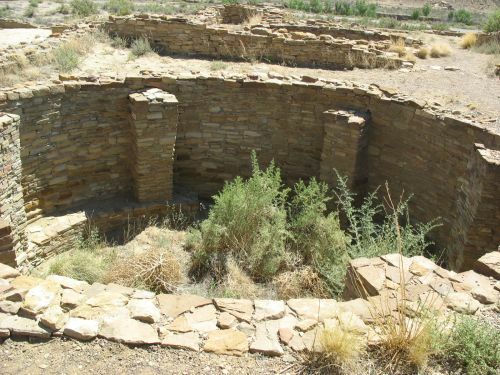 As I said earlier, I basically buy Steve Lekson‘s arguments that small (as opposed to great) kivas in the San Juan region before AD 1300 were basically residential in function and formed integral parts of household residential units consisting of a kiva and a few rectangular rooms. Identifying these units at small houses, which constitute the vast majority of sites in the eleventh century and earlier, is very straightforward. Many of these sites include just one kiva and a few rectangular rooms. These are the famous “Prudden units” first identified in the Mesa Verde region by T. Mitchell Prudden a century ago. Each seems to be pretty clearly a residential structure housing a single household. 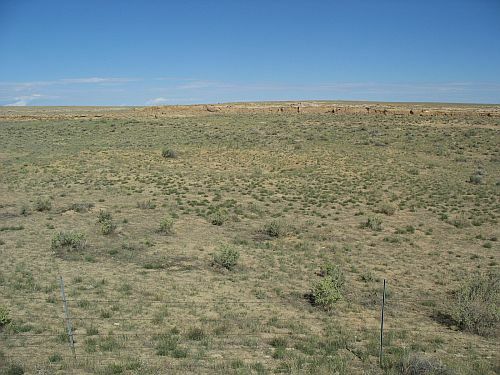 Other small sites include two or more Prudden units, but most have no more than a few and seem to indicate the presence of multiple households, probably extended families. 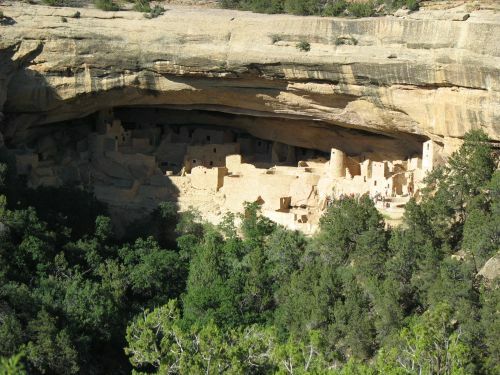 At the large aggregated sites that began to develop in the twelfth century and reached their greatest size in the late thirteenth century, just before the abandonment of the whole region during the “Great Drought” of 1276 to 1299, the most famous of which are the cliff dwellings at Mesa Verde such as Cliff Palace and Spruce Tree House, it is generally possible to identify individual suites of rooms with associated kivas equivalent to Prudden units. This suggests that these sites formed by the aggregation of existing social units without major changes in social organization. After the major societal dislocations and migrations in the period between 1275 and 1325, this is no longer the case, and the much larger aggregated pueblos of the Rio Grande Valley, as well as those in the Hopi and Zuni areas to the west, no longer have well-defined units with associated kivas. Instead they have many fewer kivas, indicating a new function for these spaces more like their current function at modern pueblos as community-wide ritual and integrative spaces. This function is probably more like the function of great kivas in earlier periods, although it is important to note that post-1300 community-scale kivas do not continue the formal attributes of previous great kivas, Chacoan or otherwise, and instead more closely resemble the smaller kivas that Lekson considers residential rather than ceremonial in function. They are, however, generally quite a bit larger than typical pre-1300 small kivas. 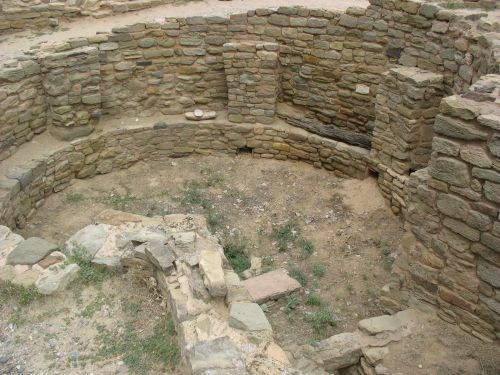 It is also in this era that we begin to see the distinction in kiva form between eastern and western pueblos that is continued to the present day, with eastern pueblos adopting round kivas and western pueblos adopting square ones. 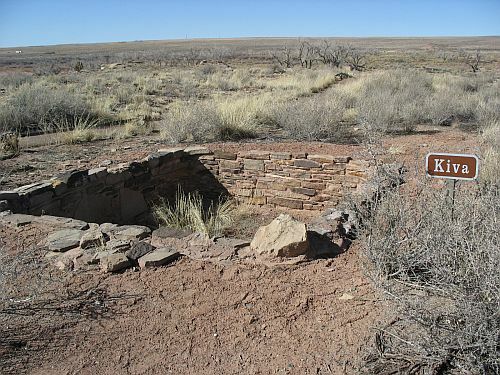 The idea, then, assuming Lekson is right, is that in the course of the massive changes around 1300 people adopted new social organizational principles, one of which was the abandonment of the kiva as a residential space and the development of a new ceremonial and social space, shaped like an earlier residential kiva but larger, that may have eased people’s integration into the new communities that were much larger and denser than what they had known before. Increased density would have led to increased social tensions, and new social institutions, probably including the kachina cult, would have been necessary to deal with these tensions. 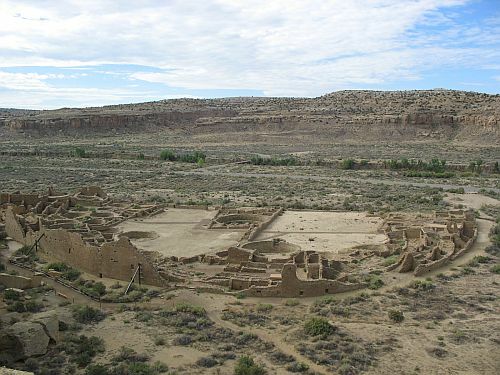 Because of all these changes, the modern pueblos are probably not good analogues for understanding pueblo life before 1300, even though they are clearly and unambiguously descended from the people who occupied pueblo sites in such areas as Chaco and Mesa Verde at that time. So that’s all well and good, but notice what’s missing from this story: the great houses associated with the system centered on Chaco between 1030 and 1130. 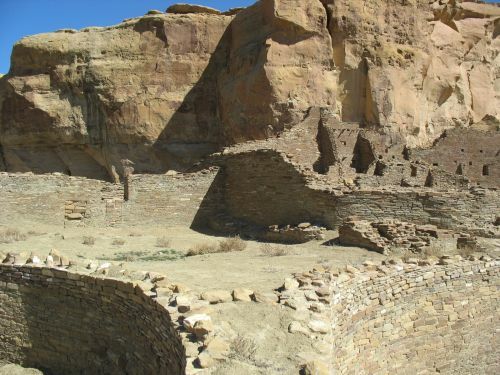 Most discussion of Chacoan architecture has focused on these very impressive buildings, particularly on the largest ones, Pueblo Bonito and Chetro Ketl, even though the vast majority of sites even at Chaco Canyon itself were small houses, and Lekson’s edited volume on Chaco architecture is no exception. 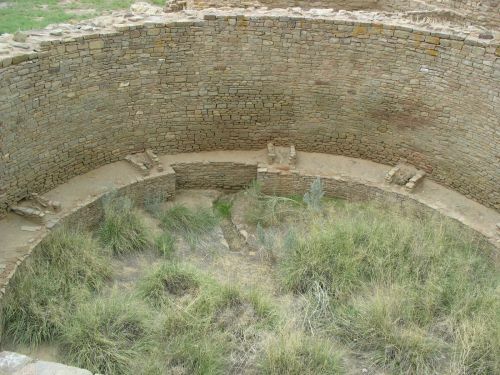 Recently one of the major debates in Chacoan archaeology has focused on the function of these structures, with some arguing that they were primarily ceremonial or administrative in function with minimal residential use, while others see them more as residences of an elite class in a hierarchical society (Lekson has referred to them as “palaces”) and a few still arguing that they were residential communities analogous to the later aggregated pueblos. Sorting this out has been tricky, especially since some of the most important sites in Chaco were excavated long ago when archaeological techniques were not what they are now and figuring out the implications of data collected at that time is very difficult. There is clearly evidence for at least some residential use at most great houses that have been excavated, but it remains unclear how much of this evidence dates to the period of Chacoan florescence rather than earlier or later, and a number of more recent lines of evidence, such as the extensive road system throughout the San Juan Basin associated with the great houses and the elaborate landscape architecture and astronomical alignments found in the vicinity of many great houses, has led others to argue that the primary function of these structures was more esoteric and ceremonial, even if a few people did live in them. One challenge has been determining the residential population of these sites. Indeed, if it were easy to determine population many of the disputes over function would probably go away. 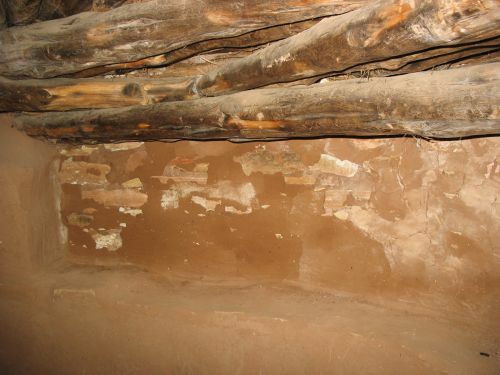 Early estimates based on raw room counts and comparisons with modern pueblos led to estimates as high as 1200 people for Pueblo Bonito alone, but more recent estimates based on the actual presence of residential features in (rectangular) rooms have gone as low as 70 for Pueblo Bonito. That’s quite a range! So what does this have to do with kivas? Well, if kivas were residential, then obviously they would have relevance to debates over residential use and population estimates. If, as seems to have been the case at small sites, each kiva corresponds to one household unit, a rough count of population could come from just counting up the number of kivas in use at a given point in time and applying some conversion factor based on the assumed size of a household. As far as I know no one has actually done this, although Lekson or someone else may have done it somewhere I haven’t seen. 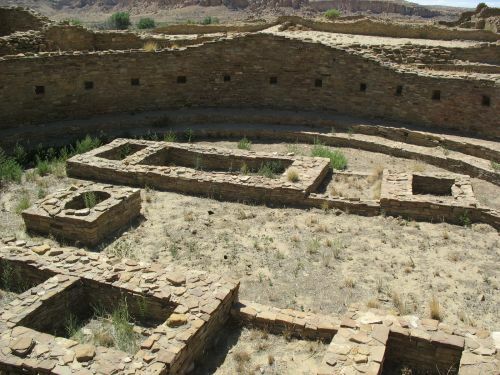 So, assuming kivas were residential, and noting the numbers of kivas at great houses, we can perhaps get a rough sense of the number of people who lived in these buildings. But who were these people? 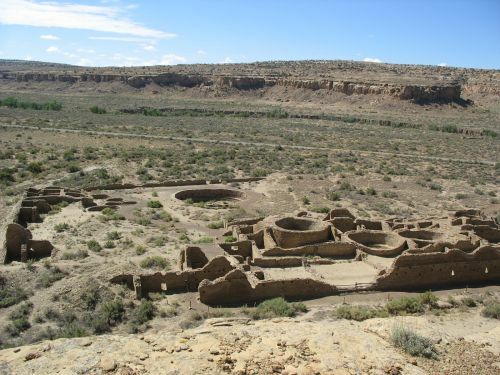 And why did they live in great houses while most other people in their communities, both inside and outside Chaco Canyon, lived in the much humbler small houses? The obvious answer is that they were the elites in a hierarchical system, but that poses as many questions as it answers. What was the nature of this system? Where did the elites get their authority, and how did they maintain it? 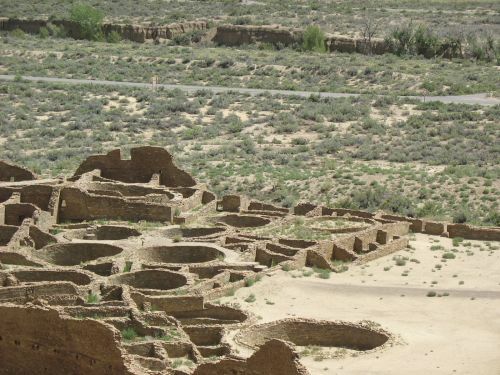 Setting aside these more fundamental questions about Chaco, however, there are also many questions raised by the idea of kivas being residential that focus more on the kivas themselves. 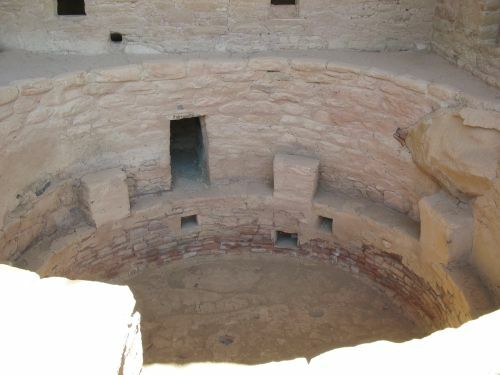 As I mentioned before, the classic “Chacoan” kivas found at the great houses have a very standardized set of features that distinguishes them from kivas elsewhere in the region. Were these characteristics of elite residences? If so, understanding their purpose would potentially be very useful in understanding the dynamics of the Chaco system more generally. Unfortunately, we don’t really have any idea what these specialized features may have meant socially or economically. They don’t seem particularly resource-intensive compared to other kiva styles, which suggests that conspicuous consumption may not have been the motivation. This makes sense, since if kivas were private, residential spaces few people would presumably have had access to them. 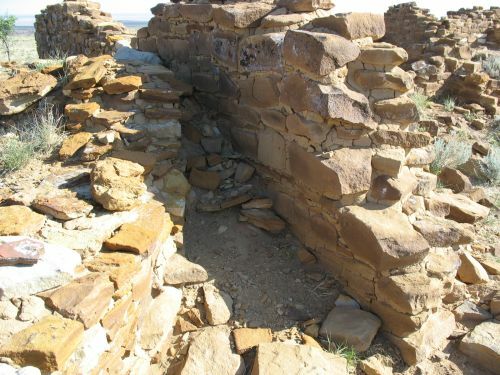 It’s also possible that the specialized features of Chacoan kivas were markers of ethnicity or heritage. In general they seem to differ most noticeably from those found in areas to the north, and they may resemble southern forms more closely. There are other suggestions of southern origins for at least some early great house architecture which may be instructive, and great kivas, which became integrated with great houses about the time the Chaco system really got going, are also generally more of a southern phenomenon. This idea of regionalism is important, I think, but I don’t have enough information to discuss it more fully just yet. One of the most striking differences between Chacoan kivas and those found elsewhere in the region is the tendency for Chacoan ones to be elevated and contained within square rooms, whereas most others were subterranean. Is this an “elite” feature? It certainly would make these residences more prominent and given their inhabitants a better view of whatever was happening in the plazas of the great houses. It would also have increased the visibility of these residences from the clifftops above the great houses in Chaco, which is discussed in the chapter on Chetro Ketl in Lekson’s architecture volume. 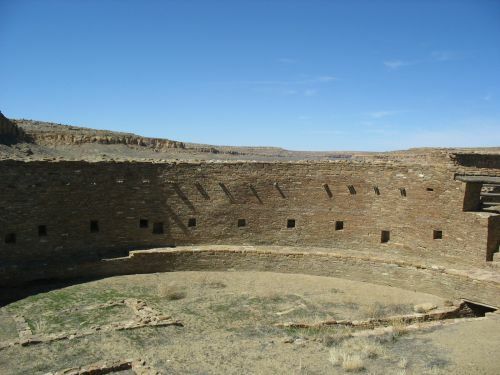 Also discussed in that chapter is the Court Kiva at Chetro Ketl, one of the small number of exceptionally large “Chacoan” kivas built into plazas rather than elevated in roomblocks. 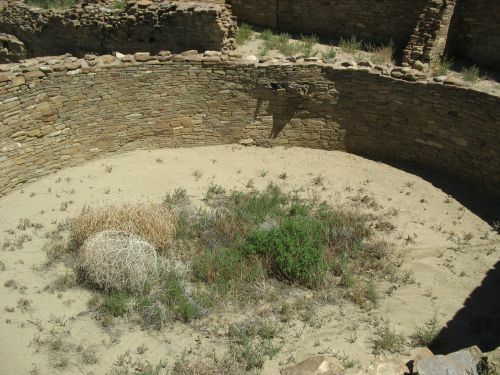 The Court Kiva was sited well into the plaza, where it was separated from the nearest rectangular rooms by a greater distance than was typical but was also particularly visible from the cliff above the site. It was later converted into a (presumably non-residential) great kiva, which is interesting and unknown anywhere else at Chaco. 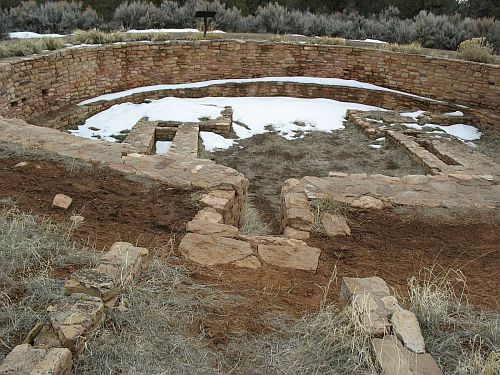 Lekson believes “kivas” at small sites were residences and, at great houses, elite residences—conspicuous and expensive housing. Building big, flashy houses would have posed a problem for emerging elites at Chaco: If homes are traditionally below grade, how do you make one conspicuous? Elevate it, get it out of the ground and up where it can be seen. The Kiva G complex, ending with a third-story “kiva,” is a remarkable example. But even elevated, enclosed kivas are not obvious from ground level; the viewer sees the rectangular exterior walls, not the house form itself. Windes does not discount the possibility that “kivas” were used in part as habitations, but he does not believe that they were “living rooms” in the traditional sense. Rectangular, surface living rooms are in fact found in great houses, but given the differences in location, shape, floor features, and artifacts, we must ask what roles these two very different types of structures took. 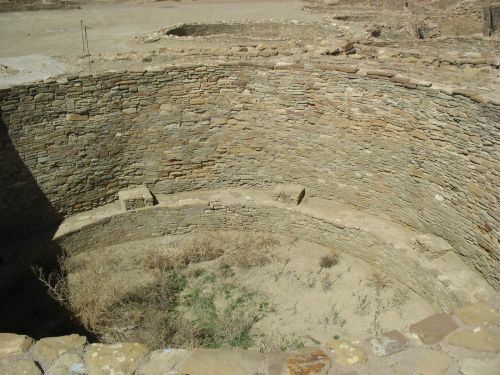 In addition, Windes believes that the small kivas represent part of the triad of structures associated with basic domestic units, as found in small sites and tucked away in the corners of great houses during the last occupations, but that the very large “court” kivas, later shifted in location from the plazas to the roomblocks, are specific to Chaco great houses and represent some activity beyond mere domestic use; in fact, their very size, sometimes with the feature attributes of great kivas, would place them as great kivas anywhere else outside the confines of the great house. Both of these interpretations are plausible, but I still find Lekson more convincing. What is the “activity beyond mere domestic use” that Windes sees these kivas serving? He doesn’t specify. He does, however, point out another important aspect of kivas that I alluded to in the previous post: the proliferation of them late in the occupation periods of many great houses, often associated with rectangular (or irregularly shaped) surface rooms and looking very similar to Prudden units or equivalent single-household residential roomblocks. The masonry on these tends to look very late, and they are most often found sunk into late plaza surfaces, so while they can rarely be dated directly it seems likely that they represent a subsequent reuse of the sites as locations for residential settlement, probably after they were no longer in use for their original purposes, whatever those might have been. Many of the original square rooms in some great houses seem to have been used for trash deposition at this time, implying that they were no longer needed for their original functions but that there were plenty of nearby residents producing trash. 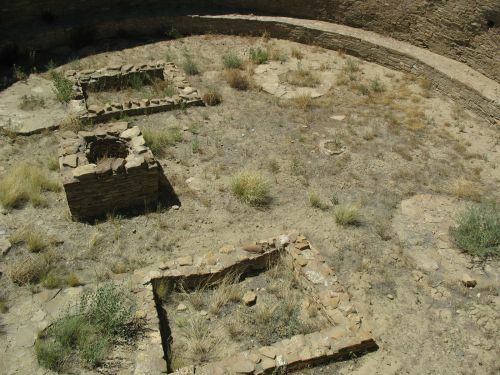 Some great kivas, however, especially Kiva A at Pueblo Bonito, also seem to have continued in use at this point, implying that the sites may still have had some ritual or integrative functions, even if they were newly being used for a new type of residential use. 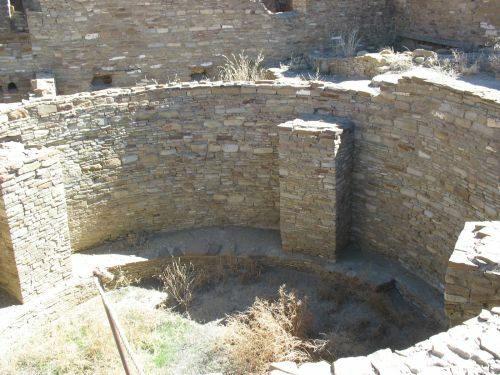 Windes is certainly right that there are square rooms with residential features in Chacoan great houses, and that this suggests that not everyonewas necessarily living in kivas, but the features of many of those square rooms are actually pretty similar in many cases to kiva features. This implies that the distinction between those who lived in kivas and those who lived in aboveground square rooms that look suspiciously like kivas may be more complicated than Windes (or Lekson) lets on. Perhaps there is some social distinction here, implicit in the architecture, that has received little to no attention in the literature but that may well be quite important. But that’s a topic for another post. 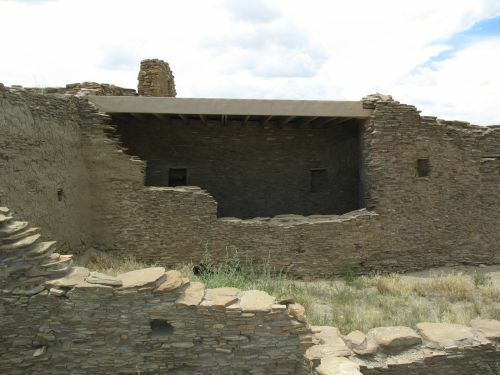 Implicit in my previous discussion of “Chacoan” kivas was the idea that the term “Chacoan” in this context refers to a specific architectural form defined by a collection of features, rather than to a geographic location. 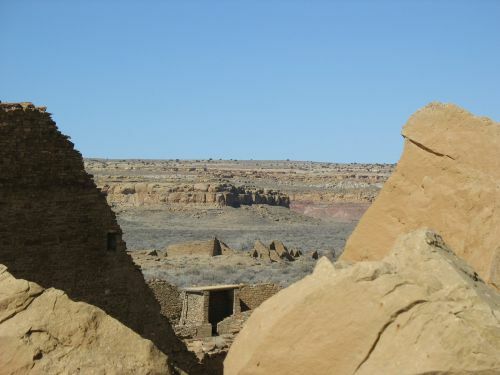 Thus, Chacoan kivas are common at Chaco Canyon, but they are also found at many sites outside the canyon, particularly at Chacoan “outliers” or sites with great houses similar to those at Chaco and other attributes that tie them to Chaco despite quite considerable distances. 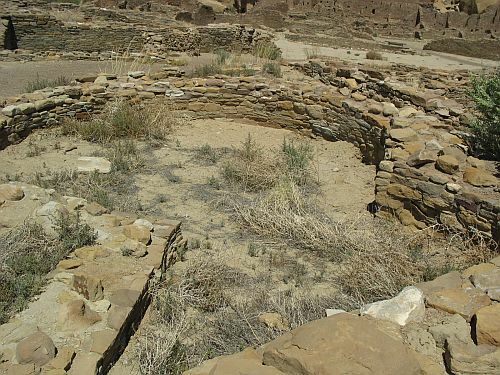 The converse is also true, in that not all kivas at Chaco are Chacoan kivas. 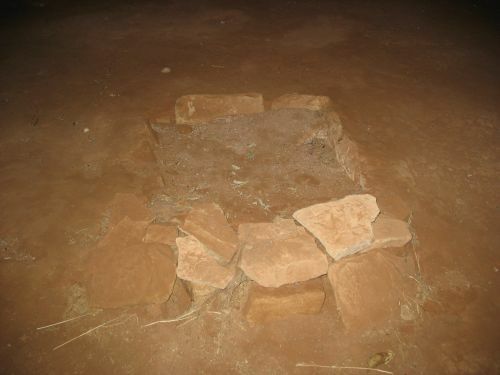 Since the Chacoan kiva form is so standardized and consistent, it is fairly easy to tell when a given kiva does not meet the criteria to be considered Chacoan, and many kivas at Chaco do not. 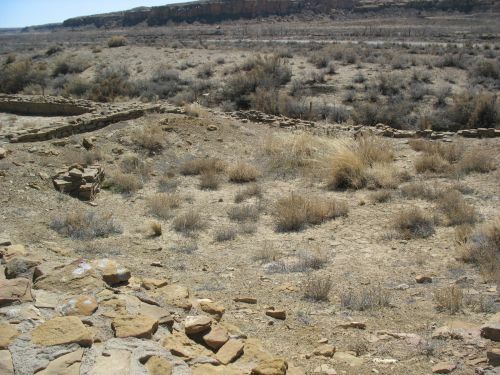 In his 2007 chapter on great house form, Steve Lekson identifies 22 excavated kivas at Chaco great houses that do not meet Chacoan criteria. 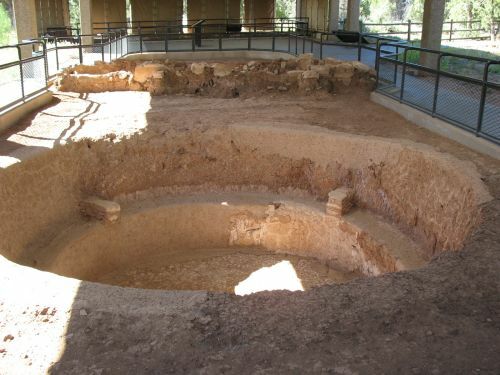 Since these are considerably smaller than the excavated Chacoan kivas, with an average diameter of 4.3 meters (as compared to an average diameter of 7.2 meters for Chacoan kivas), Lekson refers to them as “small round rooms.” This category originated as something of a catch-all for kivas that did not meet all the criteria to be considered Chacoan kivas, great kivas, or tower kivas, but in addition to the small size there are some other commonalities among these rooms. 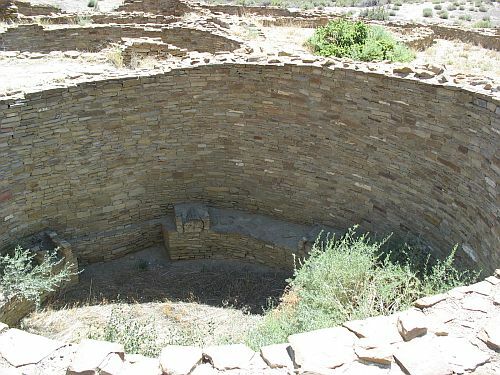 None has the full set of Chacoan kiva features, but many do have some of these features, including subfloor ventilators, southern bench recesses, and floor vaults. However, only three have bench recesses, and of those only two also have subfloor ventilators. 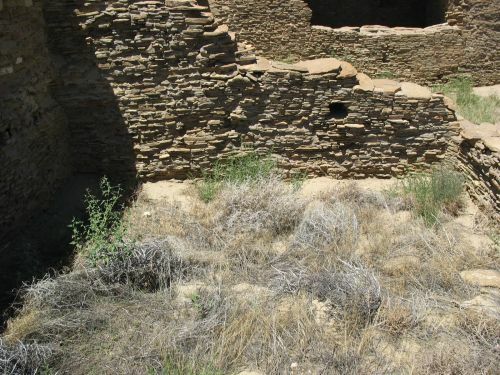 These two may actually be Chacoan kivas, although they are missing the floor vaults and beam pilasters standard to the Chacoan type, and Lekson speculates that it may be their small size that leads them to lack these features. 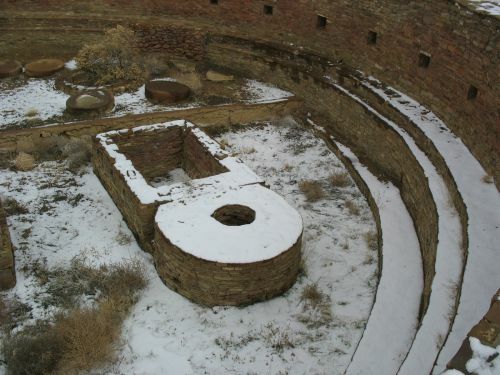 They were both built into elevated square rooms, which is typical of Chacoan kivas. Lekson defines his categories based on size rather than internal features because he wants to include unexcavated rooms, which is reasonable, but it does seem likely that these two kivas at least really are the smallest Chacoan kivas and fit the type criteria imperfectly because of their size. Foreign or not, they certainly do seem to be late. 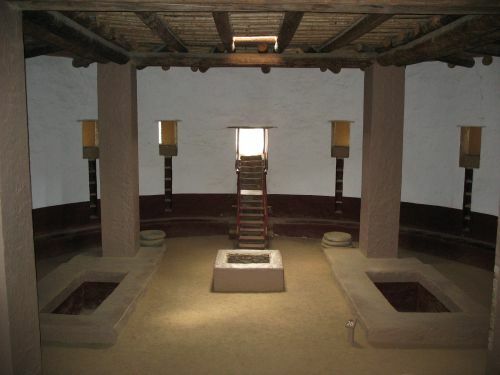 Most were added into existing square rooms in a fashion similar to that seen with elevated, blocked-in Chacoan kivas, but it is important to note that Chacoan elevated kivas were usually added into rooms that were specially built for the purpose, while non-Chacoan ones were typically added into square rooms that had previously had other uses. None of these kivas produced tree-ring dates, but Lekson considers them all to probably date to the early twelfth century or later. Subterranean examples, generally built into plazas, also seem to be late. The ones in the southeast corner of Chetro Ketl, which are still exposed today and can easily be seen, are associated with a late plaza surface. Similar ones at Pueblo Bonito have mostly been backfilled completely and are no longer visible, but they probably date to the same period. 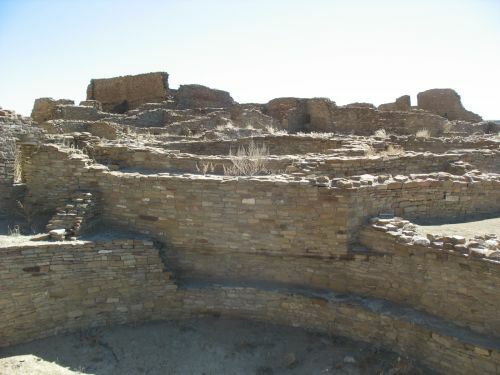 Given the increase in cultural influence from the north, especially from Aztec Ruins and the Totah area around modern-day Farmington, New Mexico, in the early 1100s, it makes sense that later Chacoan architecture would start to show northern influences during this period even if there were not a major influx of immigrants from the north (for which there isn’t really any evidence). I therefore think Lekson’s arguments for a local origin for these features are reasonable. 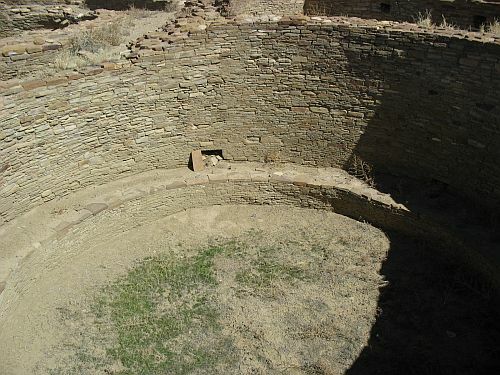 Many of the currently visible kivas at Chaco, both elevated in roomblocks and subterranean in plazas, are of this type. This has important implications for understanding what you are looking at when you visit Pueblo Bonito and Chetro Ketl. 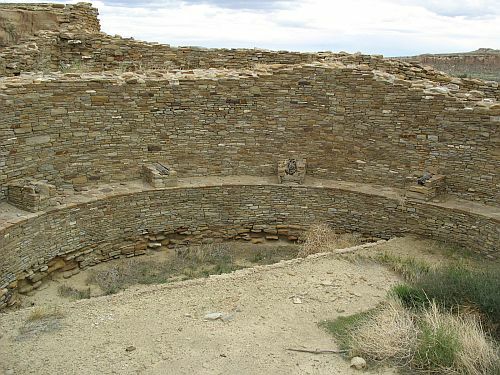 Not all of the kivas you see were occupied or used at the same time, and many of them were later additions that were probably not part of the original plan for the areas where they are located. 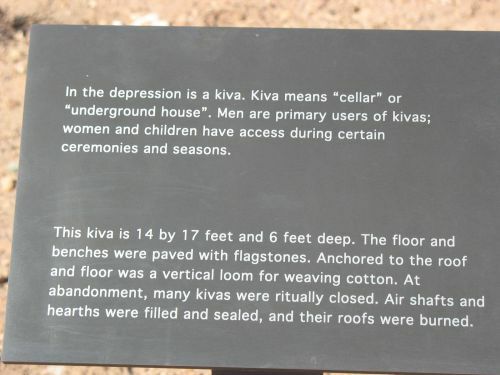 Furthermore, there are lots of other kivas that you can’t see, mostly under the plaza. To the extent that what you see at these sites reflects a moment in time, that moment was probably very late, perhaps even after the decline of Chaco from its heyday around AD 1100. Much of what you see exposed today may not have been visible then, however, and there was a lot more that you can’t see that probably was. I’m not going to go into the question of the function of all these kivas and the implications of that for the function of the sites containing them right now, although it is an important question, but the idea of change over time is important and I just want to emphasize it in a general sense right now. As I’m sure regular readers have noticed, I haven’t been posting much here over the past few weeks. As is usually the case, this is because school got in the way; this semester was particularly busy for me because it was my last one, and I had little time for blogging. I graduated about a week ago, though, so I now have plenty of time to read and blog. And with the job market the way it is, I’ll probably have quite a bit of time on my hands for at least the next few weeks. To ease myself back into thinking about Chaco after this recent hiatus I’ve been reading The Architecture of Chaco Canyon, New Mexico, edited by Steve Lekson, which is part of the series of publications forming the capstone to the Chaco Project. It’s a bit uneven, as edited volumes tend to be, but some of the chapters are very good summaries of the state of knowledge of certain aspects of Chacoan architecture as of 2007 (when the book was published). It’s definitely not an entry-level sort of book, and I would only recommend it to people who have already read some of the introductory literature on Chaco, but if you have the requisite background it’s a very good way to get up to speed on architecture issues. Among the more interesting chapters are Lekson’s on great house form (an update of a chapter from his seminal book on the topic, which is still an essential reference for Chaco architecture), Tom Windes‘s on early great houses in the San Juan Basin, and Ruth Van Dyke‘s on great kivas. Jill Neitzel‘s chapter on the history of architectural research at Pueblo Bonito is a bit weaker; it’s fine as a summary, and makes some good points, but doesn’t really go into much depth on the more interesting questions. The chapter on Chetro Ketl, by Lekson, Windes, and Patricia Fournier, is more interesting, not least because of the obvious tension between Lekson and Windes on certain points of interpretation and how that gets reflected in the text. I’m still reading the book, so I can’t say much about the remaining chapters, but they seem to be more interpretive than descriptive. The one I’m currently reading is by Wendy Ashmore and promises to be something of an outsider’s take on Pueblo Bonito, from a scholar who has specialized in Maya architecture and planning (and who has some ideas in that area that have been criticized by others, most notably Mike Smith). The next chapter, by John Stein, Rich Friedman, Taft Blackhorse, and Rich Loose, is probably the most infamous and controversial in the book, from what I’ve heard, so it should be interesting to see what it says exactly. The last chapter is a reprint of a paper by Anna Sofaer that was printed in an earlier edited volume, and I find it particularly interesting that Lekson (presumably) decided to give her the last word, given how controversial some of her theories are among Chaco archaeologists. I’ll have some more thoughts on the specific chapters in the book in subsequent posts, but for now I just want to mention a few key issues that the chapters I’ve read so far have brought up. One is the recurrent issue of exactly what the function of great houses and their constituent parts was. Over the past few years there has been an ongoing debate over whether they were elite residences or ceremonial centers (the older assumption that they were aggregated communities analogous to modern pueblos only being held by a few diehards like Gwinn Vivian), but as Neitzel points out for Pueblo Bonito it’s become increasingly clear that they were both, and the real question, to the extent that there is a real question underlying this debate, is which function was dominant, where (both within a given great house and among different ones), and when. One of the major points Neitzel makes is that this debate is both tedious and increasingly unmoored from reality, and that the whole typological approach is probably best avoided. Questions of “is it or isn’t it?” are not very helpful at this point, whether applied to a single great house or to the Chacoan phenomenon as a whole, and the use of vague typological categories like “ceremonial center” only exacerbates the problem. One aspect of the functional question that does seem to finally be getting the attention it deserves is the temporal dimension. It seems pretty clear that at least some great houses changed in function over time, though the extent to which this was the case in general is unclear (as, indeed, is the question of whether “great house” is actually a meaningful category of structure). Windes makes clear in his chapter that as far as we can tell early great houses outside of Chaco were primarily residential in function, although few have been excavated so it’s hard to be certain about this. The data for the earliest great houses inside the canyon is not much better, even for the ones that have been excavated, but it also seems that they were probably initially residences. There is also substantial evidence that many great houses had residential functions at the end of their occupation, in the twelfth and thirteenth centuries. 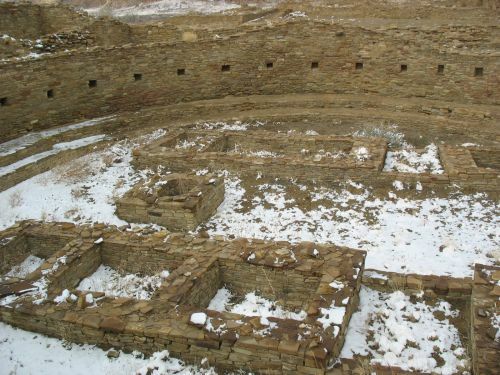 The big question is the extent to which great houses were residences during the “Chacoan era” of roughly AD 1030 to 1130, when the Chaco system reached its height and new great houses were being built all over the place. These buildings probably had multiple functions, and it seems plausible that at least some had residential functions, but it’s frustratingly difficult to tease out the uses of specific rooms and spaces during this period, partly because neither built-in features (often dating earlier) nor artifacts (often dating later) are necessarily related to uses at this time. A related issue is the function of kivas (or “round rooms”) specifically. Lekson sees them as primarily residential, with the ceremonial functions traditionally attributed to them on the basis of (rather lazy) ethnographic analogy being a later development. 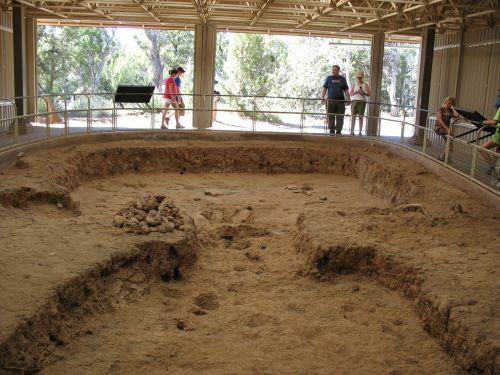 I find his arguments pretty convincing, and they seem to be increasingly accepted among other archaeologists, especially to the north in the Mesa Verde region, where the sheer numbers of kivas associated with all sorts of sites, and the careful recent excavation data from many sites, is making it increasingly clear that small kivas were indeed residential structures. This attitude is also beginning to be adopted further south at Chaco itself, and many people on the interpretive staff at Chaco have been incorporating Lekson’s arguments into their tours, which is important because visitors very often ask about this. I, of course, talked up Lekson’s interpretation a lot when I gave tours at Chaco. There are some issues about the functions of great houses that arise from this interpretation, however, and the chapters I’ve read so far in this book really only allude to them. I’ll talk more about this later. Part of Lekson’s reinterpretation of kiva function is the idea that “great” kivas are fundamentally different from small round rooms, and really did have the ceremonial or community-wide integrative functions traditionally implied by the term “kiva” (there some issues with terminology surrounding these interpretations that I won’t go into now). 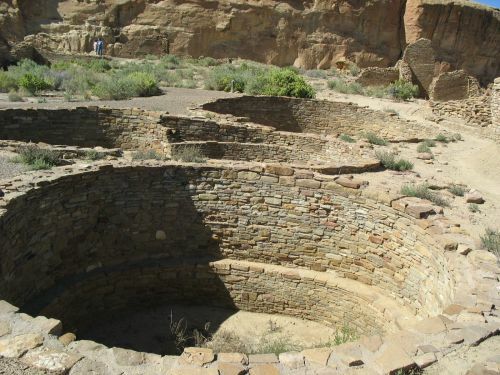 Certainly the uniformity of the Chacoan great kiva form, and the marked differences between great kivas and small kivas, is consistent with this argument, and Ruth Van Dyke’s chapter is a good collection of the information available about great kivas in the canyon. Only a few of these are exacavated, and not all of them have been well-documented, which makes interpretation a bit hazardous. The general uniformity of Chacoan great kivas both in and out of the canyon is striking, however, and it argues for a considerable amount of standardization and a key role in the Chacoan system. The relationship between great houses and great kivas is another perennial topic of debate, partly due to the limited dataset available. 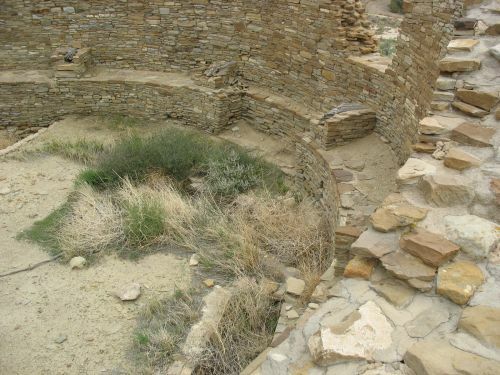 Van Dyke argues that the association between the two forms is relatively late, and that the building of great kivas at great houses such as Pueblo Bonito starting around 1040 was an attempt to justify new societal arrangements associated with the rise of the Chaco regional system by associating them with the much older great kiva form. 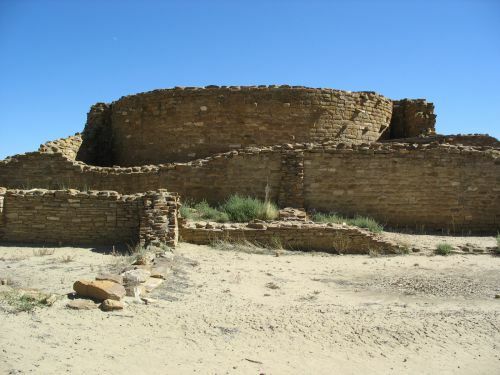 There may well be something to this, but there is also some evidence for great kivas associated with the early great houses at Chaco in the 900s, which complicates the argument. I’ll do a post on this later. Finally, one issue that arises particularly in Windes’s chapter on origins is regional variations in architecture and the possible implications of this for migration and connections to areas outside of the central San Juan Basin. 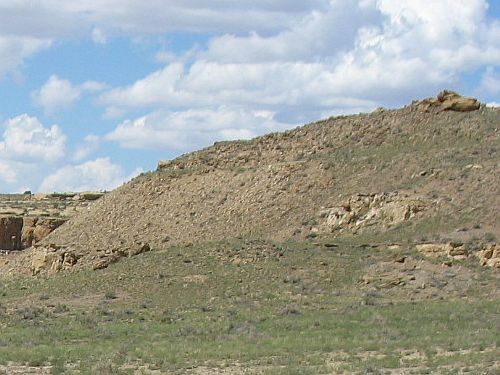 There has been an increasing consensus that there is some connection between the collapse of the Pueblo I villages in southwestern Colorado in the 800s and the huge increase in population in the San Juan Basin to the south around the same time, and similarities between sites like McPhee Pueblo in the Dolores area and early great houses like Pueblo Bonito seem to imply a cultural connection of some sort. 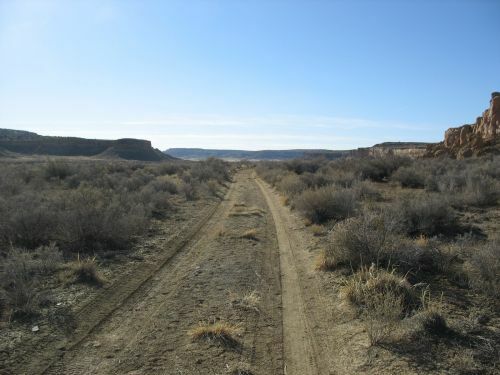 Connections to the south have been studied less, but Windes points out that many early great-house communities have sightlines to prominent southern landmarks such as Hosta Butte, rather than northern ones like the Huerfano. As far as I know no one has done a really systematic study of which architectural forms correspond to which regions, and the ability to do such a study would be complicated by the numerous migrations over time that are becoming increasingly apparent in the early archaeological record of the region. It would be a useful thing to try, however. Again, I’ll do a more in-depth post on this later. Clearly there’s a lot to say about Chaco architecture and community planning, and with my newly acquired graduate degree in planning I suppose I am well-situated to address these issues, which I intend to do in the coming days and weeks. However, there are also other topics I want to cover in future posts, including coal, cotton, and chocolate. Stay tuned.